Samuel F. Reynolds, a former skeptic, had a life-changing visit to an astrologer and has since spent nearly 30 years reading charts and studying Astrology. Samuel consults, writes, and teaches Astrology full-time. 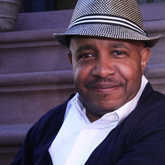 He also serves on a few Astrology organizational boards such as ISAR, and has written for many publications including Ebony.com, New York Magazine, MySign.com, The Mountain Astrologer, and Pride. Sam is also an entrepreneur who helps others build their businesses as mind-body-spirit practitioners. His website is unlockastrology.com. You can also email him at unlockastrology@gmail.com.